1 Check your existing battery for a model number. Search the website using the model number for a match. 2 First of the battery’s physical size, i.e. measure the old battery or the size of the mounting tray and check that against the size of the new battery. An exact match down to the millimetre is not necessary, an approximate match is OK.
3 Next check the size of the battery terminals, they will need to match the battery clamps you have. Terminals come in either 10mm or 20mm diameter. 4 The location of the positive and negative terminals is an easily overlooked point. Look at your existing battery and note which side the positive and negative terminals are on, or if you don’t have an existing battery check your battery clamps the one with the red cover and a plus sign is the positive side, the one with the black cover and minus sign is the negative one. Make sure your replacement battery matches this order. 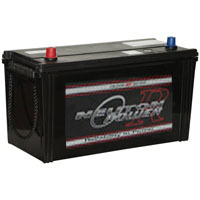 5 For the most reliable results choose a battery that meets your vehicles CCA and RC ratings. Using a lower rated battery will shorten the service life of the battery and could cause electrical or starting problems. Using a battery that is rated a little higher will not cause you any issues and will give you a longer service life.